In her New York Times bestselling Outlander novels, Diana Gabaldon introduced millions of readers to a dazzling world of history and adventure--a world of vibrant settings and utterly unforgettable characters. When Gabaldon opened the door further to one of these characters, Lord John Grey, readers were fascinated by her portrait of eighteenth-century London--a seething anthill of nobility and rabble peopled by soldiers and spies, whores and dukes. 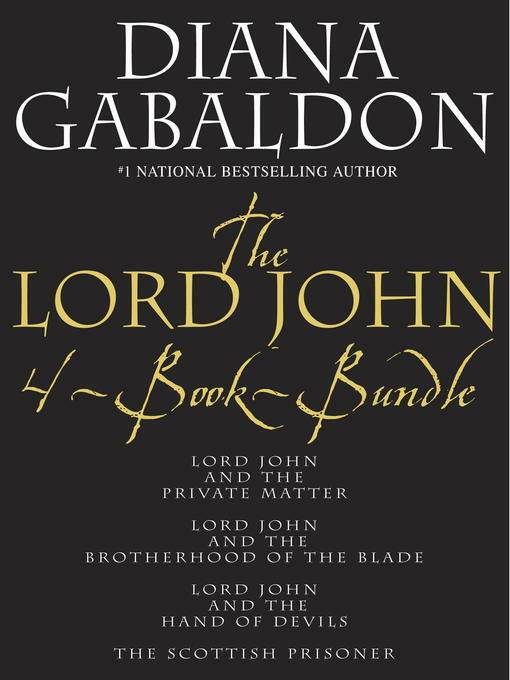 Now, with this four-volume eBook bundle, you can discover the novels that have won over Gabaldon fans, both old and new. The year is 1757. On a clear morning in mid-June, Lord John Grey emerges from London's Beefsteak Club, his mind in turmoil. A nobleman and a high-ranking officer in His Majesty's Army, Grey has just witnessed something shocking. But his efforts to avoid a scandal that might destroy his family are interrupted by something still more urgent: the Crown appoints him to investigate the brutal murder of a comrade in arms, who may have been a traitor. And so begins the series that has delighted millions. . .